Affordable Kihei, Maui, Studio Where You'll Ease Into Island Comfort. Kihei Bay Surf is an affordable, fully-equipped, studio condo in Kihei, Maui. The partial ocean view from your lanai overlooks the Pacific Whale Foundation and Kalepolepo public beach park that is an historical landmark for native fishermen. A short walk from the condo front door takes you to Sugar Beach and stretches more than three miles all the way around the bay to Maalaea. It is one of the longest white sand beaches in the world. During whale season you may see whales and their calves come close to shore here. This vacation condo is on the second floor of a two story complex and features a walk in tile shower, full kitchen, bath, air conditioning, CD stereo and flat screen TV with DVD. Password secured Wi-fi is also available so you can stay connected during your stay. The common area offers a pool, hot-tub, BBQ, tennis court, and laundry facilities. Linens, utensils, cooler, umbrella, and beach chairs are provided. Pets and smoking are NOT allowed. 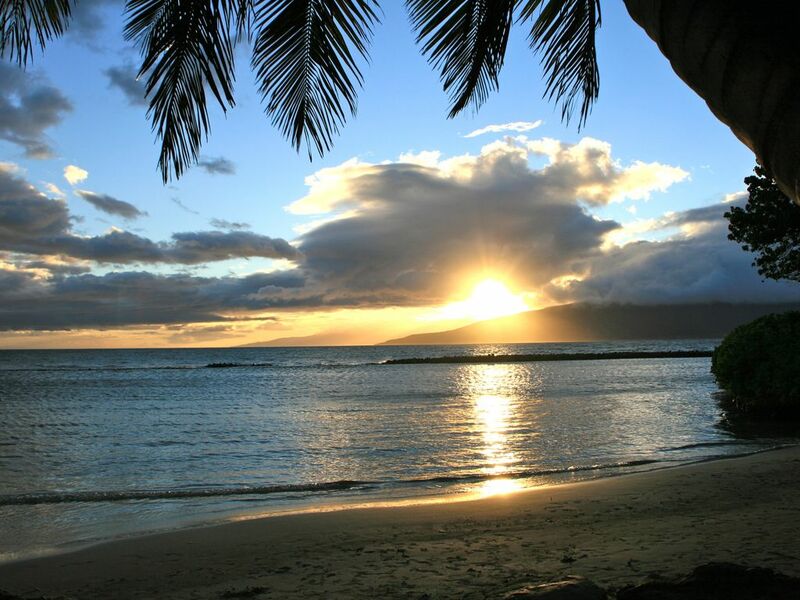 Kihei is centrally located on the south shore and is close to restaurants, shopping, grocery and gift stores, snorkeling, surfing, beautiful beaches, and golf. The Ma'alaea Boat Harbor featuring the Maui Aquarium, whale/turtle watching, snorkel charters, and sunset dinner cruises is only minutes away. Public transportation is available with a bus stop steps away and in front of Kihei Bay Surf. Maui is a windsurfing paradise! Kihei Bay Surf is less than a quarter mile from south shore launches, including Maui Sunset and Pavilions, and eight miles from north shore launches of Kanaha, Sprecks, and Hookipa. We'd love to share our little home in paradise with you! Recent remodeled bathroom fully tiled shower with optional hand held adjustable pressure controlled shower head. Partial ocean view obstructed by trees. Window unit replaced with new air conditioner, May, 2018. Linens provided to include bedding, bathroom, kitchen, and beach towels. Laundry facilities located on the property ground floor. Plenty of free parking on premises. Refer to your condo information provided by owner for username and password information. Kitchen hand towels, bath towels, hand/wash cloths, and beach towels. Main room of studio includes bed, couch, dining table, TV, stereo, sliding glass door that leads to lanai. Automatic drip coffee maker, filters provided. Full kitchen that includes all utensils and dishwashing liquid, dishwasher tablets for the first few days. There is also a rice cooker, blender, coffee maker. Dining room table in the main room of the studio. There is also a table and 2 chairs outside on the lanai (back porch of the condo). There is a large table and benches common area by BBQ. Flat screen high definition television with remote control. Tennis court available in the common area next to the pool. There are 2 racquets and balls located in the closet inside the condo.